Did you know that Hyderabad is famous for its rock formations? And, there is an entire society dedicated to saving these rocks from destruction and to preserve the natural beauty of the Deccan Plateau. Spread across various places in the city, like Banjara Hills, Jubilee Hills, Gachibowli, Khajaguda are marvellous natural rock formations. Believed to be over 2,450 million years older than the mere traces of Himalayas, these rocks lend a historic charm to Hyderabad. They also play a part in formations of lakes and other water bodies, thereby being an integral part of our ecosystem. However, over the past few years, some of these natural heritage sites have faced the wrath of urbanisation. Though they look like they could fall with just a mighty push, these geological beauties have weathered the test of not just time but survived earthquakes and all kinds of harsh weather too. So, why should us humans have any right to damage them? It was with this intention that Society To Save Rocks was formed. Made up of a group of artists, photographers, nature lovers, and just about any other citizen who aim to protect these ancient rocks, this society has been putting thorough efforts to see that these significant boulders remain strong. 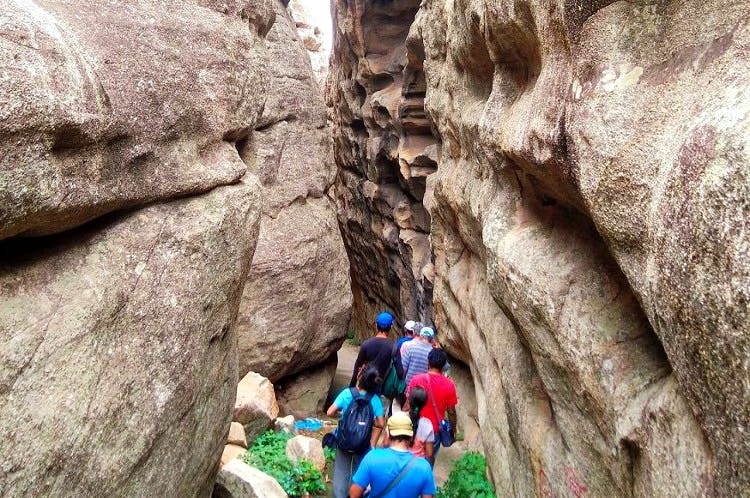 In its endeavour to help people realise the aesthetic and ecological value of these rocks, the society conducts regular rock walks where you can trek amidst nature to the various rocky areas in and around the city. They are conducted on the third Sunday of every month and provide an adventurous getaway as well as an educative means to understand our region better. Often, rock climbing activities are also organised so that you can have a thrilling experience (participating in this often leads to a new found love for these beauties). The society has also made a documentary showcasing the uniqueness of these rocks (No other city in India has such tremendous landscapes) and discussing their contribution to the environment. Being open to all and at no cost, you get to be a part of a movement of sorts and have fun while at it. You can find out more about their activities, follow them on Facebook here.